AutoCAD OEM 2018 is based on AutoCAD® and has almost the same feature set as AutoCAD, but products built with AutoCAD OEM are not necessarily fully customizable CAD systems. As a licensed AutoCAD OEM developer, you choose how much access end users have to the AutoCAD feature set and customization features. You choose the commands and features you will support. AutoCAD OEM products can use any AutoCAD functionality internally, while limiting CAD functionality supplied to end users. This architecture provides security for your product and the data your product creates and edits. Next, you should use a copy of AutoCAD and run the ‘core’ tutorials, as well as any feature-specific tutorials that are of interest. If you don’t have access to AutoCAD you can download a 30-day trial from the Autodesk website. To customize AutoCAD, as well as AutoCAD OEM features, you need to use the APIs in ObjectARX SDK. The SDK comes fully documented and with sample projects in supported programming languages. Download the SDK for AutoCAD from here. To learn the API in depth go through the Self-paced ObjectARX Training Lab. Note: There is a separate ObjectARX included in the AutoCAD OEM toolkit that must be used for AutoCAD OEM customization. Products built with AutoCAD® OEM software development platform use AutoCAD to read DWG™ and DXF™ file formats for every version of AutoCAD® design software and can write DWG files for AutoCAD software Release 14 or its later versions. DXF files can be written back to AutoCAD software Release 12 version. Use the AutoCAD OEM MakeWizard to speed and simplify your product creation cycle. The wizard’s simple graphical interface makes it easy for you to customize your CAD software product. When you use the MakeWizard, only the files required for your application are included in your product, shortening its build time and optimizing its size. Create host programs that run your AutoCAD OEM software development platform in a child window, Microsoft® Windows® .NET Form, or through a web page. The in-place activation control enables your customers to interact with your AutoCAD OEM design software while remaining in the host program or browser. With the AutoCAD OEM software development platform, you have full control of the level of AutoCAD functionality your users see. This enables you to manage the design activities of your users based on their specific process or purpose. AutoCAD OEM also provides encryption and binding security mechanisms that help prevent copying or reverse-engineering of your LISP software programs. AutoCAD OEM software development platform tools enable you to brand your OEM-based product with its own name and identity. Using the MakeWizard and OEM InstallerWizard, control the About box image, splash screens, installer banners, and screen characteristics, such as bitmaps and product icons. AutoCAD characteristics can be hidden or displayed prominently, depending on the customer and your product's market requirements. AutoCAD OEM development platform supports ObjectARX® programming environment, Visual LISP®, ActiveX®, and the .NET Framework. It also supports the tools in standard AutoCAD software for customizing menus, toolbars, and quick keys. Find out more about AutoCAD OEM features from these FAQs. The OEM Developer’s Guide provides comprehensive information on AutoCAD OEM usage and is included on the AutoCAD OEM installation in the Help directory in either OemDev.chm or OemDev.pdf. Once you are ready to build your AutoCAD OEM-based product, you should read through the Developer’s Guide and work through the provided AutoCAD OEM Tutorial. Tech Soft 3D provides regular training classes on the OEM platforms. Please contact us for information about the next scheduled AutoCAD OEM training class in your area. Create and save your project framework using the AutoCAD OEM Make Wizard. This step produces a directory structure that contains the basic files needed to build your product. Decide which commands and system variables from AutoCAD OEM you will reuse and which ones you need to design yourself. The commands you support determine the files copied into your run tree for final distribution. Decide which AutoCAD OEM API best serves the bulk of your product's functionality. Generally, ObjectARX and the managed APIs are the most powerful environments, but it can require more development time. Most products require some use of AutoLISP®. 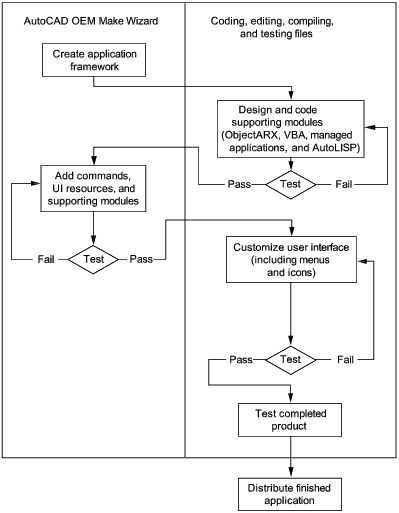 Design, code, and test your applications to implement specific functionality. You can often reuse code from your existing AutoCAD applications in the AutoCAD OEM environment. Using the AutoCAD OEM Make Wizard, add custom commands, menus, and modules to your framework. Bind your ObjectARX, AutoLISP, VBA, and ObjectARX managed modules to your product using the AutoCAD OEM Make Wizard. This ensures that only your product can use the files, and no other files can be substituted. Customize the interface and product presentation. Build your product using the AutoCAD OEM Make Wizard. Thoroughly test the AutoCAD OEM product. Tools are provided to bind your product's support files with the AutoCAD OEM engine. In addition to protecting your proprietary files, binding prevents the AutoCAD OEM engine from being used for any other product. It also keeps the product from being used with any AutoCAD OEM engine other than the licensed one. With AutoCAD OEM 2018, you can deliver the features of AutoCAD® 2018 in your products. AutoCAD OEM 2018 includes the new features of AutoCAD 2018, also the AutoCAD OEM Make Wizard has been updated to reflect new commands and features. For additional information on the new AutoCAD commands and features, see the AutoCAD product documentation, or visit the Autodesk website. How do AutoCAD and AutoCAD OEM Differ? Although most features of AutoCAD OEM are the same as their counterparts in AutoCAD, there are several differences. In addition, AutoCAD OEM defines a few native commands and system variables that do not exist in AutoCAD. Most AutoCAD commands and system variables are available for use in your product, including the ETRANSMIT, RENDER, and DBCONNECT commands. The interface to system variables and the ability to change them depends on what you want to “publish” to the end user. Some system variables are published by default, based on their inclusion in various dialog boxes. However, as the AutoCAD OEM product vendor, you determine whether to publish the commands that call the dialog boxes. For example, by default the DIMSTYLE command provides a user interface for changing dimension variables. If your product does not support dimensioning, or if you wish to set all dimension variables internally in your product, you should not publish the DIMSTYLE command. Any system variables that you want to be available to end users from the menu, toolbar, or keyboard must be listed as allowed commands. Most of the settings in the Options dialog box are the same between AutoCAD and AutoCAD OEM with the main exceptions being the Profiles and Online tabs. The Profiles and Online tabs are not available in AutoCAD OEM. The AutoCAD OEM command line supports input from keyboard, script files, pasted text, and even the Windows SendMessage() API. Like the AutoCAD command line, the AutoCAD OEM command line also supports transparent commands that interrupt the command currently running. However, an AutoCAD OEM command or system variable works in an AutoCAD OEM stamped product only if the product is configured to support it. Because the AutoCAD OEM Make Wizard allows you to toggle support for individual commands, you can present to the user only those commands required by your product, and you can provide the documentation needed for only those commands. You can customize the command line interface to suit your product's needs. For example, to simplify navigation for the user, you may want to present only three of the eleven different options of the ZOOM command. You do this with the Redefine option in the AutoCAD OEM Make Wizard. You can also turn off the command line in your product. If you do so, users will be able to invoke commands only from the menu or a toolbar. AutoCAD OEM lets you disable the AutoCAD text window if you choose to do so. With AutoCAD OEM, you can have multiple menus. AutoCAD OEM uses all AutoCAD menu sections except the Screen menu section. AutoCAD OEM also does not support LISP in menus. The only other limitations are those imposed by command and system variable changes for AutoCAD OEM. With AutoCAD OEM you can also enable menu customization for the end user by supporting the CUI command. In a stamped AutoCAD OEM product, if you support the CUI command, the user can load an alternate menu. You can also support the CUILOAD and CUIUNLOAD commands so that users can manage partial menus. AutoCAD OEM maintains toolbar state identically to AutoCAD. When the CUI command is supported, end users can create, modify, or delete toolbars. AutoCAD OEM supports only HTML Help. The help file is called when the user presses the F1 key and both native and custom content can be customized to be context sensitive. The Visual LISP IDE is available to AutoCAD OEM you as developer for customization of the OEM based application. However, you cannot create or use VLX files (Visual LISP packed applications). Moreover, you cannot use Visual LISP functions related to ActiveX®, including vl‑load-com, vlax-* and vlr-* functions. End users cannot enter AutoLISP expressions at the Command prompt, or using customization or script files.